Best coffee app I've ever seen! I liked this app a lot on my iPhone, on the iPad its like an interactive coffee table book. You can have this version with your coffee, at any table. The app FORCES me to rate, share, or subscribe. Otherwise I can't see anything! Now they've got their wish - I rate their app!! 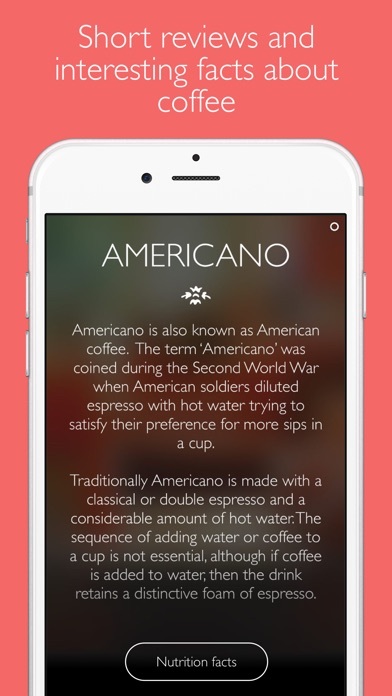 Overall, the app has a beautiful layout and explanation for each espresso drink. However, for the $3, there is a very limited amount of drinks covered by this app. More recipes in the future would be wonderful. The app is a very good and comprehensive app. It's my favorite so far. My only suggestion is to change the pictures of some of the coffees. I know that they are pictured (and often served) in white cups, but sometimes a layer of water ends up looking like milk because of the white cup. Of course you can tap on it and it shows you what each layer contains, but it would be more pleasing to the eye to see these in a clear glass rather than a white cup, so you can appreciate the various layers better (for example as seen in some of the specialty coffees towards the end of the list in the app, like in the Vienna coffee). This app is great but it needs more coffee drinks added! This app is about coffee and stuff like that so it needs more recipes! The more the better because the diversity of the app! No deep link to the app? Great I can search for coffee in the app but no deep linking to that coffee in the app? It's aesthetically pleasing but I thought I'd get a lot more for my money. It's amazing how tasty and beautiful designed an app can be if you put love in this topic. More drinks please. Great interface, nice images and clear information! Love it! I enjoy coffee and this app enables me to try many different types in the comfort of my home. Good job. For all the coffee makers and coffee lovers I highly recommend this app. It pains me to put 3 stars because the functionality and presentation is superb, but the lack of brew ratios makes it a 3 star app. For instance if you look at Turkish coffee brew method it says to put "some" finely ground coffee into the brew vessel. They do include ratios for the basic espresso drinks which is awesome but they need it for everything else. I understand there is some debate and personal preference involved with brew ratios but I was hoping to use this app as a consolidated reference for coffee drinks. A baseline or start point is too easy and would make this a beautiful one stop shop for coffee brewing info. 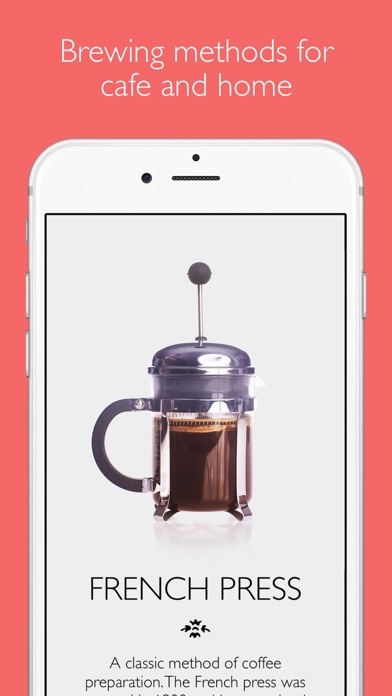 Both beautiful and useful, this app is worth every penny if you love coffee. With this version, the app developer has reached "great." Thank you for adding the "on-boarding" tutorial to let users know how to use the app. Please consider adding a link to the main page or espresso/method summary page (the one reached by clicking the tiny "o") called "Navigation" or "Using the App." I may not use the app for a couple of months, and I would forget the subtle navigation. I need a way to relearn the use of the app. Thank you for the app, my espresso has improved! Use it from time to time in the coffee shop!! The lack of specificity and direction do not make this app ideal. 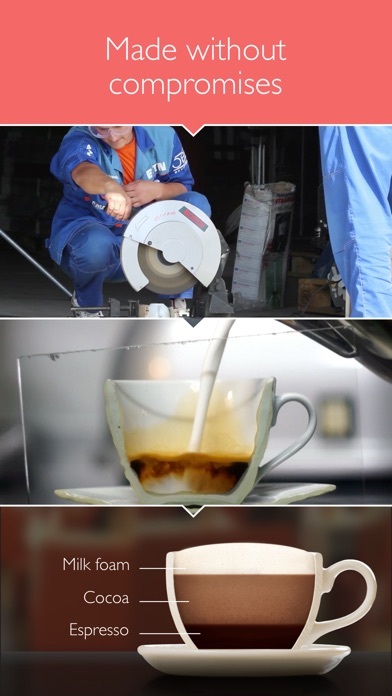 It does have a nice variety of pictures and very ambiguous directions for prepping the coffee drinks. Things like water temp, amount of grounds, coarseness, etc are non existent for the most part. Beautiful and easy to use. 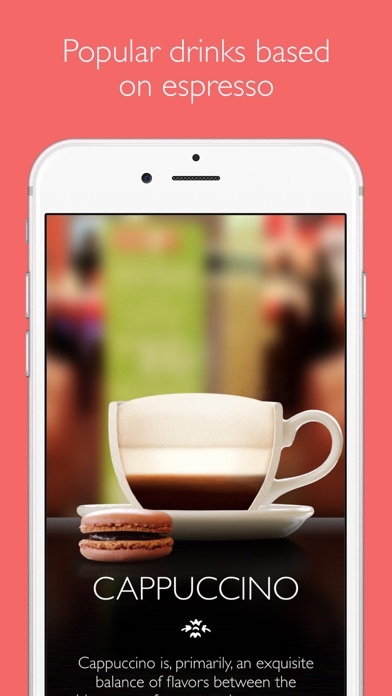 A must have app to any coffee lover. Great way to get to know all these different ways of getting your caffeine fix. Highly recommended. 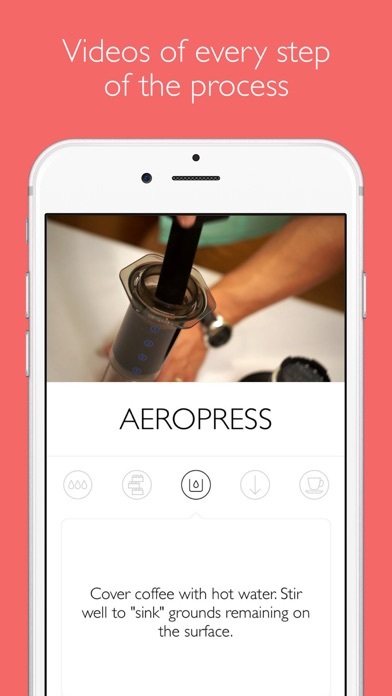 This is a very nicely designed app that'll excite every coffee lover. Great photos, great music, great UX and a surprising amount of offered languages. I highly recommend this app. Great, informative app. Only critique, not quite sure why it costs $3. So worth every contributed dollar for the devs. I thought I knew espresso drinks until I loaded this. I'm learning Italian next! I love this app almost as much as coffee! Hands down the BEST coffee app! informative content, beautiful design, easy to use. very well-thought out app! Smooth App. Clear Instructional videos. Simple and nice infographics. A must for beginners. More drinks - breve, etc Needs full recipes But otherwise I like it, but paying this much I expected MUCH more. I dont know if it's in fact real and the crappa's description and that there's also a video instruction of it was hilarious. This app is great. The interface is good looking and it flows well. The information seems more editorialized or opinionated at some points. Nice user interface, but completely lacking any specific details needed for brewing coffee. It's a great app. Thanks for producers.